For the independence struggle in the Hispanic American nations, see Spanish American wars of independence. The Latin American Wars of Independence were the revolutions or a revolutionary wave, that took place during the late 18th and early 19th centuries and resulted in the creation of a number of independent countries in Latin America. These revolutions followed the American and French Revolutions which had profound effects on the British, Spanish, Portuguese, and French colonies in the Americas. Haiti, a French slave colony, was the first to follow the United States; the Haitian Revolution lasted from 1791 to 1804, when they won their independence. The Peninsular War with France, which resulted from the Napoleonic occupation of Spain, caused Spanish Creoles in Spanish America to question their allegiance to Spain, stoking independence movements that culminated in the wars of independence, which lasted almost two decades. At the same time, the Portuguese monarchy relocated to Brazil during Portugal’s French occupation. After the royal court returned to Lisbon, the prince regent, Pedro, remained in Brazil and in 1822 successfully declared himself emperor of a newly independent Brazil. Cuban independence was fought against Spain in two wars (Ten Years and Little War). Cuba and Puerto Rico remained under Spanish rule until the Spanish–American War in 1898. During the 18th century Spain recovered much of the strength she had lost in the 17th century but her resources were under strain because of the incessant warfare in Europe from 1793. This led to an increased local participation in the financing of the defense and an increased participation in the militias by the locally born. Such development was at odds with the ideals of the centralized absolute monarchy. The Spanish did also formal concessions to strengthen the defense: In Chiloé Spanish authorities promised freedom from the Encomienda for those indigenous locals who settled near the new stronghold of Ancud (founded in 1768) and contributed to its defense. The increased local organization of the defenses would ultimately undermine metropolitan authority and bolster the independence movement. The Napoleonic Wars were a series of wars fought between France (led by Napoleon Bonaparte) and alliances involving Britain, Prussia, Spain, Portugal, Russia and Austria at different times, from 1799 to 1815. In the case of Spain and its colonies, in May 1808, Napoleon captured Carlos IV and King Fernando VII and installed his own brother, Joseph Bonaparte on the Spanish Throne because he didn’t want anyone outside of his own bloodline to rule Spain. This event disrupted the political stability of Spain and broke the link with some of the colonies which were loyal to the Bourbon Dynasty. The local elites, the creoles, took matters into their own hands organizing themselves into juntas to take “in absence of the king, Fernando VII, their sovereignty devolved temporarily back to the community.” The juntas swore loyalty to the captive Fernando VII and each ruled different and diverse parts of the colony. Most of Fernando’s subjects were loyal to him in 1808, but after he was restored to the Spanish crown in 1814, his policy of restoring absolute power alienated both the juntas and his subjects. He abrogated the Cadiz Constitution of 1812 and persecuted anyone who had supported it. The violence used by royalist forces and the prospect of being ruled by Fernando shifted the majority of the colonist population in favor of separation from Spain. The local elites reacted to absolutism in much the same way that The British colonial elites, Tory and Whig alike, had reacted to London’s interference before 1775. Graphs showing the make-up of the royalist army at the time of the revolution. The colonial army of the Spanish Empire in Americas was made up of local American and European supporters of King Ferdinand. The Royalists’ were made up of a cross-section of society loyal to the crown with Americans composing the majority of the royalist forces on all fronts. There were two types of military units: from the regular Spanish army which were sent out or formed with local Europeans and called Expidicionarios and units called veterans or militias created in the Americas. The militias included some veteran units and were called the disciplined militia. Only 11% of the personnel in the militias were European or American whites. After Rafael del Riego‘s revolution in 1820 no more Spanish soldiers were sent to the wars in the Americas. In 1820 there were only 10,000 soldiers in Royal Army in Colombia and Venezuela, and Spaniards formed only 10% of all the royalist armies, and only half of the soldiers of the expeditionary units were European. By the Battle of Ayacucho in 1824, less than 1% of the soldiers were European. Other factors included Enlightenment thinking. The Enlightenment spurred the desire for social and economic reform to spread throughout Latin America and the Iberian Peninsula. Ideas about free trade and physiocratic economics were raised by the Enlightenment. Independence movements in South America can be traced back to slave revolts in plantations in the northernmost part of the continent and Caribbean. In 1791, a massive slave revolt sparked a general insurrection against the plantation system and French colonial power. These events were followed by a violent uprising led by José Leonardo Chirino and that sprung up in 1795 Venezuela, allegedly inspired by the revolution in Haiti. Toussaint L’Ouverture was born a slave in Saint-Domingue where he developed labor skills that would give him higher privileges than other slaves. He intellectually and physically advanced resulting in promotion, land of his own, and owning slaves. In 1791, slaves in Haiti formed a revolution to seek independence from their French owners. L’Ouverture joined the rebellion as a top military official with the intention to abolish slavery without complete independence. However, through a series of letters written by Toussaint, it became clear that he grew open to equal human rights for all that live in Haiti. Similar to how the United States Constitution was ratified, the enlightenment ideas of equality and representation of the people created an impact of change against the status quo that sparked the revolution. The letter details the great concerns of he felt due to a conservative shift in France’s legislature after the revolution in 1797. The greatest fear was that these conservative values could give ideas to the French Government to bring back slavery. The enlightenment has proven to forever change the way a captive society thinks after L’Ouverture refuses to let the French send him and his people back into slavery. “…when finally the rule of law took the place of anarchy under which the unfortunate colony had too long suffered, what fatality can have led the greatest enemy of its prosperity and our happiness still to dare to threaten us with the return of slavery?” Ultimately, slavery was abolished from French colonies in 1794 and Haiti declared Independence from France in 1804. When Mexico achieved its independence in 1821 with the Treaty of Córdoba, the Captaincy General of Guatemala that had ruled Central America became politically independent as well, without the necessity of violent struggle. Guatemala declared its own independence September 15, 1821, likely to prevent the Mexican Army of the Three Guarantees from “liberating” Guatemala and over-riding nascent local autonomy. However, Guatemala chose to be annexed to the First Mexican Empire, led by royalist-turned-insurgent military leader Agustín de Iturbide, who was proclaimed emperor of Mexico in 1822. When Iturbide abdicated from the monarchy and Mexico took steps to be a republic, Central America claimed its independence. The Cuban War of Independence was the last of three liberation wars that Cuba fought against Spain, the other two being the Ten Years’ War (1868–1878) and the Little War (1879–1880). The final three months of the conflict escalated to become the Spanish–American War.A contingent of US Navy ships blockaded several Cuban ports. The Americans decided to invade Cuba and to start in Oriente, where the Cubans had control. After several failed revolts, the Portuguese colony of Brazil declared independence, forming a separate, local empire founded by Prince Regent Dom Pedro I. The war between the Brazilians and Portuguese lasted from February 1822, with the burst of first skirmishes between militias, to November 1823, when the last Portuguese garrisons surrendered. The Brazilian Empire lasted until a coup in 1889 overthrew the monarchy leading to its current status as a republic. The crisis of political legitimacy in Spain with the Napoleonic invasion sparked reaction in Spain’s overseas empire. The outcome in Spanish America was that most of the region achieved political independence and instigated the creation of sovereign nations. The areas that were most recently formed as viceroyalties were the first to achieve independence, with the old centers of Spanish power in Mexico and Peru with strong and entrenched institutions and elites were the last to achieve independence in this era. The two exceptions to independence were the islands of Cuba and Puerto Rico, which with the Philippines, remained Spanish colonies until the 1898 Spanish-America War. After the defeat of Spain in the Peninsular War and the abdication King Ferdinand VII, the Spanish colonial government of the Viceroyalty of the Río de la Plata, present-day Argentina, Bolivia, Chile, Paraguay and Uruguay, became greatly weakened. Without a rightful king in the Spanish throne to render the office of the Viceroy as legitimate, the right of Viceroy Baltasar Hidalgo de Cisneros to govern came under fire. The local elites, tired of the Spanish trade restrictions and taxes, seized the opportunity and during the May Revolution of 1810, removed Cisneros and created the first local government, the Primera Junta. Following a half a decade of battles and skirmishes with provincial royalist forces within the former Vice-royalty along with military expeditions across the Andes to Chile, Peru and Bolivia led by General José de San Martín to finally end Spanish rule in America, a formal declaration was signed on July 9, 1816 by an assembly in San Miguel de Tucumán, declaring full independence with provisions for a national constitution. The Argentine Constitution was signed in 1853, declaring the creation of the Argentine Republic. Following upheaval caused by the May Revolution, along with the independence movements in Chile and Venezuela, local struggle for independence kicked off with two failed revolutions that. Over sixteen years of struggle followed before the first steps towards the establishment of a republic were taken. 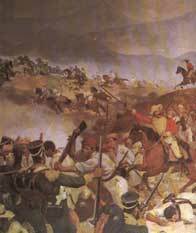 Formally, it is considered that the fight for independence culminated in the Battle of Ayacucho, on December 9, 1824. The Chilean Independence campaign was led by the Liberator General Jose de San Martin with the support of Chilean exiles such as Bernardo O’Higgins. The local independence movement was composed of Chilean-born criollos, who sought political and economic independence from Spain. The movement for independence was far from gaining unanimous support among Chileans, who became divided between independentists and royalists. What started as an elitist political movement against their colonial master, finally ended as a full-fledged civil war. Traditionally, the process is divided into three stages: Patria Vieja, Reconquista, and Patria Nueva. The first uprising against Spanish rule took place in 1809, and criollos in Ecuador set up a junta on September 22, 1810 to rule in the name of the Bourbon monarch; but as elsewhere, it allowed assertion of their own power. Only in 1822 did Ecuador fully gain independence and became part of Gran Colombia, from which it withdrew in 1830. At the Battle of Pichincha, near present-day Quito, Ecuador on May 24, 1822, General Antonio José de Sucre‘s forces defeated a Spanish force defending Quito. The Spanish defeat guaranteed the liberation of Ecuador. Independence in Mexico was a protracted struggle from 1808 until the fall of royal government in 1821 and the establishment of independent Mexico. In the Viceroyalty of New Spain, as elsewhere in Spanish America in 1808, reacted to the unexpected French invasion of the Iberian peninsula and the ouster of the Bourbon king, replaced by Joseph Bonaparte. Local American-born Spaniards saw the opportunity to seize control from Viceroy José de Iturrigaray who may well have been sympathetic to creoles aspirations. Iturrigaray was ousted by pro-royalists. A few from among the creole elites sought independence, including Juan Aldama, and Ignacio Allende, and the secular parish priest Miguel Hidalgo y Costilla. Hidalgo made a proclamation in his home parish of Dolores, which was not recorded in writing at the time, but denounced bad government and gachupines (pejorative for peninsular-born Spaniards), and declared independence. The unorganized hordes following Hidalgo wrought destruction on property and the lives of whites in the region of the Bajío. Hidalgo was caught, defrocked, and executed in 1811, along with Allende. Their heads remained on display until 1821. His former student José María Morelos continued the rebellion and was himself caught and killed in 1815. The struggle of Mexican insurgents continued under the leadership of Vicente Guerrero and Guadalupe Victoria. From 1815 to 1820 there was a stalemate in New Spain, with royalist forces unable to defeat the insurgents and the insurgents unable to expand beyond their narrow territory in the southern region. Again, events in Spain intervened, with an uprising of military men against Ferdinand VII and the restoration of the liberal Spanish Constitution of 1812, which mandated a constitutional monarchy and curtailed the power of the Roman Catholic Church. The monarch had repudiated the constitution once the Spanish monarchy was restored in 1814. For conservatives in New Spain, these changed political circumstances threatened the institutions of church and state. Royal military officer Agustín de Iturbide seized the opportunity to lead, making an alliance with his former enemy Guerrero. Iturbide proclaimed the Plan de Iguala, which called for independence, equality of peninsular and American-born Spaniards, and a monarchy with a prince from Spain as king. He persuaded the insurgent Guerrero to form an alliance with him and creating the Army of the Three Guarantees. Crown rule in New Spain collapsed when the incoming Viceroy Juan O’Donojú signed the Treaty of Córdoba recognizing Mexico’s sovereignty. With no European monarch presenting himself for the crown of Mexico, Iturbide himself was proclaimed emperor Agustin I in 1822. He was overthrown in 1823 and Mexico was established as a republic. Decades of political and economic instability ensued which resulted in a decline in population. Paraguay gained its independence on the night of May 14 and the morning of May 15, 1811, after a plan organized by various pro-independence nationalists including Fulgencio Yegros and José Gaspar Rodríguez de Francia. Spain initially had the support of the Lima oligarchs because of their opposition to the commercial interests of Buenos Aires and Chile. Therefore, the Viceroyalty of Peru became the last redoubt of the Spanish Monarchy in South America. Nevertheless, a Creole rebellion arose in 1812 in Huánuco and another in Cusco between 1814 and 1816. Both were suppressed. These rebellions were supported by the armies of Buenos Aires. Peru finally succumbed after the decisive continental campaigns of José de San Martín (1820–1823) and Simón Bolívar (1824). While San Martin was in charge of the land campaign, a newly built Chilean Navy led by Lord Cochrane transported the fighting troops and launched a sea campaign against the Spanish fleet in the Pacific. San Martín, who had displaced the royalists of Chile after the Battle of Maipú, and who had disembarked in Paracas in 1820, proclaimed the independence of Peru in Lima on July 28, 1821. Four years later, the Spanish Monarchy was defeated definitively at the Battle of Ayacucho in late 1824. After independence, the conflicts of interests that faced different sectors of Creole Peruvian society and the particular ambitions of the caudillos, made the organization of the country excessively difficult. Only three civilians—Manuel Pardo, Nicolás de Piérola and Francisco García Calderón—acceded to the presidency in the first seventy-five years of Peru’s independence. The Republic of Bolivia was created from Upper Peru. In 1837 a Peru-Bolivian Confederation was also created but was dissolved two years later due to Chilean military intervention. Following the events of the May Revolution, in 1811 José Gervasio Artigas, led a successful revolt against the Spanish forces in the Provincia Oriental, now Uruguay, joining the independentist movement that was taking place in the Viceroyalty of the Río de la Plata at the time. In 1821, the Provincia Oriental was invaded by Portugal, trying to annex it into Brazil under the name of Província Cisplatina. The former Vice-royalty of the Río de la Plata, The United Provinces of the River Plate, fought back Brazil in a war that lasted over 2 years, eventually turning into a stalemate. The Brazilian forces withdrew with the United Provinces keeping them at bay but failing to win any decisive victory. With neither side gained the upper hand and the economic burden of the war crippling the United Provinces economy, the Treaty of Montevideo was signed in 1828, fostered by Britain, declaring Uruguay as an independent state. According to the Encyclopedia Americana of 1865, General Francisco de Miranda, already a hero to the French, Prussians, English and Americans had garnered a series of successes against the Spanish between 1808 and 1812. He had effectively negated their access to all the ports on the Caribbean, thus preventing them from receiving reinforcements and supplies and was essentially conducting mopping-up operations throughout the country. At that point he convinced Simon Bolivar to join the struggle and put him in charge of the fort at Puerto Cabello. This was all at once a supply and arms depot, a strategic port and the central holding facility for Spanish prisoners. Through what amounts to a gross dereliction of duty, Simon Bolivar neglected to enforce the customary security dispositions before departing to a social event. During the night there was an uprising of the Spanish prisoners and they managed to subdue the Independentist garrison and gain control of the supplies, the arms and ammunition, and the port. The Loyalist forces progressively regained control of the country and eventually Monteverde’s successes forced the newly formed congress of the republic to ask of Miranda that he sign a capitulation at La Victoria in Aragua, on July 12, 1812, thus ending the first phase of the revolutionary war. After the capitulation of 1812, Simón Bolívar turned over Francisco de Miranda to the Spanish authorities, secured a safe passage for himself and his closest officers and fled to New Granada. He later returned with a new army, while the war had entered a tremendously violent phase. After much of the local aristocracy had abandoned the cause of independence, blacks and mulattoes carried on the struggle. Elites reacted with open distrust and opposition to the efforts of these common people. Bolívar’s forces invaded Venezuela from New Granada in 1813, waging a campaign with a ferocity captured perfectly by their motto of “war to the death“. Bolívar’s forces defeated Domingo Monteverde’s Spanish army in a series of battles, taking Caracas on August 6, 1813 and besieging Monteverde at Puerto Cabello in September 1813. With loyalists displaying the same passion and violence, the rebels achieved only short-lived victories. The army led by the loyalist José Tomás Boves demonstrated the key military role that the Llaneros came to play in the region’s struggle. Turning the tide against independence, these highly mobile, ferocious fighters made up a formidable military force that pushed Bolívar out of his home country once more. In 1814, heavily reinforced Spanish forces in Venezuela lost a series of battles to Bolívar’s forces but then decisively defeated Bolivar at La Puerta on June 15, took Caracas on July 16, and again defeated his army at Aragua on August 18, at a cost of 2,000 Spanish casualties out of 10,000 soldiers as well as most of the 3,000 in the rebel army. Bolívar and other leaders then returned to New Granada. Later that year the largest expeditionary force ever sent by Spain to America arrived under the command of Pablo Morillo. This force effectively replaced the improvised llanero units, who were disbanded by Morillo. Bolívar and other republican leaders returned to Venezuela in December 1816, leading a largely unsuccessful insurrection against Spain from 1816 to 1818 from bases in the Llanos and Ciudad Bolívar in the Orinoco River area. In 1819 Bolívar successfully invaded New Granada, and returned to Venezuela in April 1821, leading a large army of 7,000. At Carabobo on June 24, his forces decisively defeated Spanish and colonial forces, winning Venezuelan independence, although hostilities continued. Provinces of the South American viceroyalties. Great Britain and the United States were rivals for influence in the newly independent sovereign nations. As a result of the successful revolutions which established so many new independent nations, United States President James Monroe and the Secretary of State John Quincy Adams drafted the Monroe Doctrine . It stated that the United States would not tolerate any European interference in the Western Hemisphere. This measure ostensibly was taken in order to safeguard the newfound liberties of these new countries, but it was also taken as a precautionary measure against the intrusion of European states. Since the United States was a newly founded nation, it lacked the capacity to prevent other European powers from interfering, for that the United States looked for Britain’s help and support to execute the Monroe Doctrine into action. Great Britain’s trade with Latin America greatly expanded during the revolutionary period, which until then was restricted due to Spanish mercantilist trade policies. British pressure was sufficient to prevent Spain from attempting any serious reassertion of its control over its lost colonies. Internal divisions also resulted in internecine wars. For example, Gran Colombia proved too fragile and the South American nation collapsed within ten years. Because many of the political strongmen of this period (caudillos), who came to power were from the military, a strong authoritarian streak marked many of the new governments. There were countless revolts, coup d’états and inter-state wars, which never allowed Latin America to become united. This was exacerbated by the fact that Latin America is a land of various and very diverse cultures that do not identify with, nor have a sense of unity, with one another. The Spanish Empire in America was reduced to three Caribbean islands: Cuba and Puerto Rico. Santo Domingo was under Spanish rule for some years before definitive independence was achieved. After three independence wars in Cuba, the 1898 Spanish–American War ended Spanish colonial rule. Brazil achieved its independence peacefully in 1822, becoming a monarchy, the Empire of Brazil. It retained its territorial integrity following independence, as opposed to the fragmentation of Spanish America into separate republics. Brazil was an anomaly in Latin America as a large, successful and stable monarchy until 1889, when the monarchy was overthrown following the abolition of slavery, and República Velha (“Old Republic”) was founded. The notion of closer Spanish American cooperation and unity was first put forward by the Liberator Simón Bolívar who, at the 1826 Congress of Panama, proposed the creation a league of American republics, with a common military, a mutual defense pact, and a supranational parliamentary assembly. This meeting was attended by representatives of Gran Colombia (comprising the modern-day nations of Colombia, Ecuador, Panama, and Venezuela), Peru, the United Provinces of Central America (Guatemala, El Salvador, Honduras, Nicaragua, and Costa Rica), and Mexico. Nevertheless, the great distances and geographical barriers, not to mention the different national and regional interests, made union impossible. Sixty-three years later the Commercial Bureau of the American Republics was established. It was renamed the International Commercial Bureau at the Second International Conference of 1901–1902. These two bodies, in existence as of 14 April 1890, represent the point of inception of today’s Organization of American States. ^ Ossa Santa Cruz, Juan Luis (2010). “La criollización de un ejército periférico, Chile, 1768-1810”. Historia (in Spanish). 42 (II): 413–448. Retrieved 27 January 2016. ^ Chambers, Sarah C., and John Charles Chasteen. Latin American Independence: An Anthology of Sources. Indianapolis: Hackett Pub., 2010. Print. ^ Ralph Lee Woodward, Central America: A Nation Divided. 2nd edition. New York: Oxford University Press 1985, pp. 85-90. ^ David Bushnell, Wars of Independence: South America,” in The Encyclopedia of Latin American History and Culture, vol. 5, p. 447. New York: Charles Scribner’s Sons 1996. ^ Fuertes Medina, Aurelia. “History of Ecuador”. A Guide to Andean Countries. Archived from the original on 1998-12-01. ^ Fred Rippy, Rivalry of the U.S. and Great Britain over Latin America (1808-1830) New York, Octagon Press, 1964 [c1929]. Humphreys, R. A. and Lynch, John (editors). The Origins of the Latin American Revolutions, 1808–1826. New York, Alfred A. Knopf, 1965. Kaufman, William W.. British Policy and the Independence of Latin America, 1804–1828. New Haven, Yale University Press, 1951. Robertson, William Spence. France and Latin American Independence. New York, Octagon,  1967. Zea, Leopoldo. The Latin-American Mind. Norman, University of Oklahoma Press, 1963.